We were having a party at the bar that night to celebrate Super Bear and the Fin Whales that were seen during dinnertime. Just as the party was dying down because it was nearly midnight, all of the staff and guides suddenly vanished, we thought they had turned into pumpkins! But just on the STROKE of midnight there was an announcement on the speaker, stating a Blue Whale had been spotted! 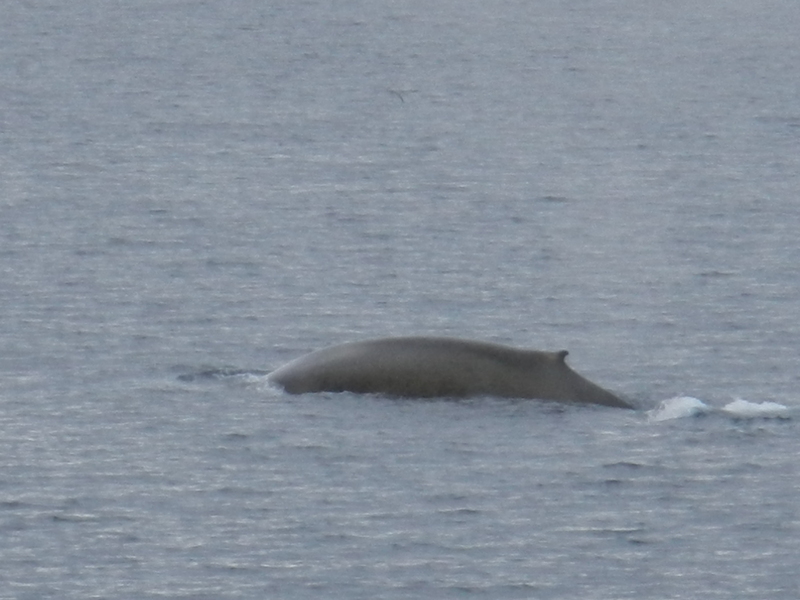 We weren’t as confident as we should have been though, because during dinner there was an announcement beholding the presence of a Blue Whale, which just turned out to be another Fin Whale. When we got up to the bridge it was a real Blue Whale, and no one could hold in their amazement (and their warmth, we were still in our party clothes!). This sighting was the most southerly one of the whole trip, which turned out to be amazing because we were already out of the Blue Whale’s known distribution! In contrast to the very late night sighting of the last Blue Whale, our next Whale’s announcement was our wakeup call! The Blue Whale was spotted just before 7:30, though loads of people turned up to see it. This sighting was even further north than our last one, just above 80 degrees, which made it more special. The reason we spot these whales when they spend most of their time underwater is because you can easily hear them breathing! You can differentiate a Blue Whale from all the other whales by its mottling on its side, the tiny dorsal fin and its HUGE size! 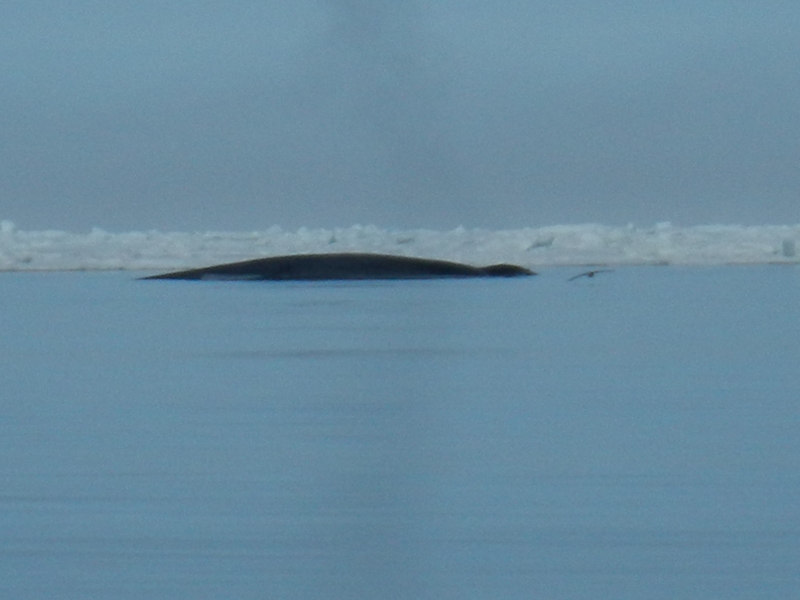 Further north still, these Blue Whales were spotted as we were zodiac cruising the SEA ICE, way above 80 degrees and the furthest north we reached on the whole voyage! Our last Blue Whale sighting was also the only one to be seen from the zodiacs, as the first one was spotted by Will the geologist as we were loading them. Once the boats were loaded (with people), we headed off in the direction the Whale was last seen. Soon enough we counted three Blue Whales, and were able to say that we had been in a boat on a Blue Whale’s footprint, seen a Blue Whale above 80 degrees north and been in the water with three in 30 minutes! A commoner relative of the Red-Legged Kittiwake of the northern Pacific, these gulls nested at every bird cliff we visited, including the one where Super Bear performed its stunt! The Kittiwakes nested at the top of the cliff, whereas the Brunnich’s and Black Guillemots nested at the bottom half, which mean that the Polar Bear was aiming for Brunnich’s Guillemot eggs and chicks (with the odd Glaucous Gull!). 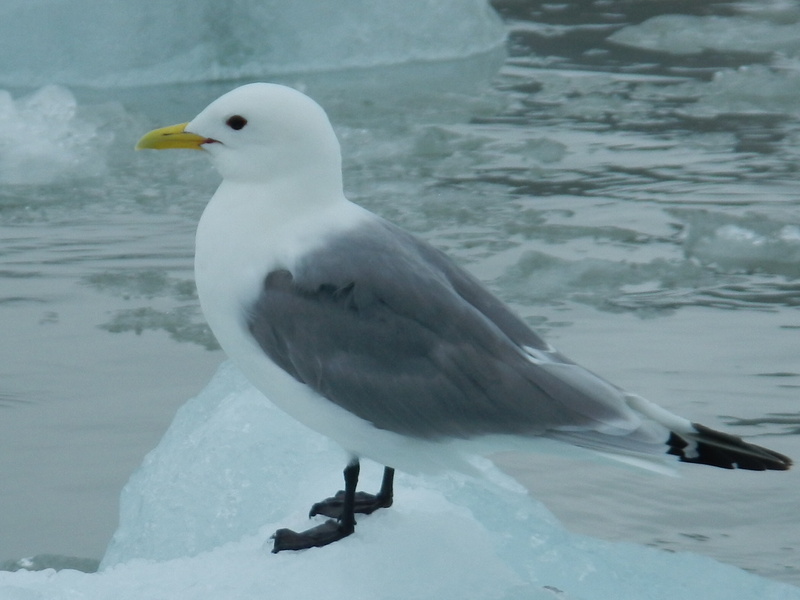 Adult Black-Legged Kittiwakes are relatively easy to identify, with a pure black eye; clean yellow bill; black wing tips; light grey wings; White underside and, obviously, black legs. Juveniles have a dark smudge behind the eye; a black collar; black bill; grey legs and a W on their wings, visible in flight. 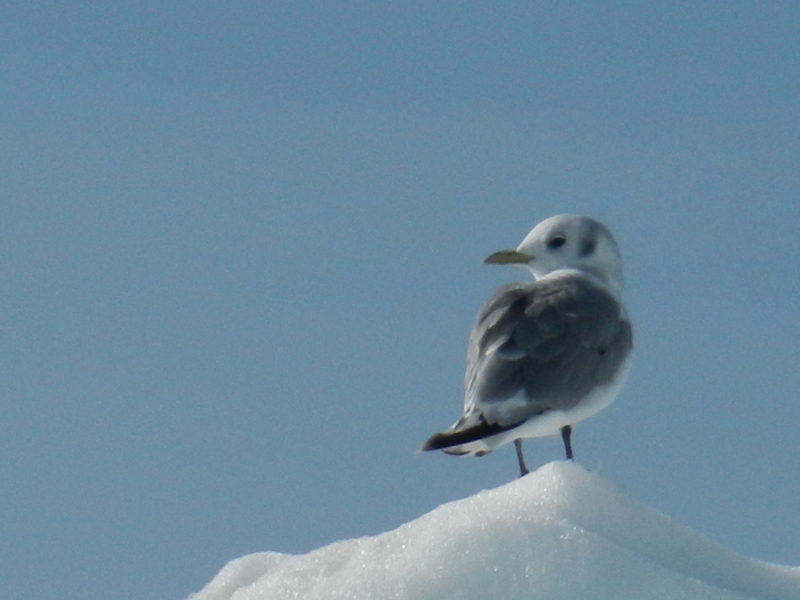 When visiting the glaciated bays, we often observed hundreds of Black-Legged Kittiwakes and Fulmars (not a gull, a tubenose sp.) flocking around the entrance of an ice cave: they were doing this to get at the nutrient-rich water flowing from underneath the glacier. These are very large gulls that were seen practically everywhere and they are very brave too! Going back to the Super Bear story it was the Glaucous Gulls who were mobbing the Polar Bear, though the Bear did get a tad angry (which cost a poor Glaucous Gull its life). 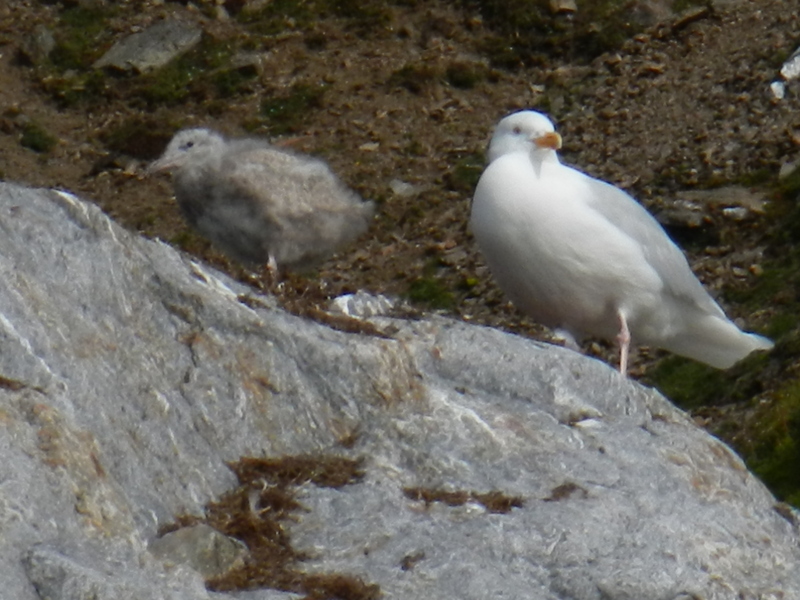 Going back down the food chain, we once observed a Glaucous Gull swallow a Kittiwake/Guillemot chick whole! Glaucous Gulls like to nest on large boulders near a bird cliff as Glaucous Gulls specialise in swooping up to a ledge-nester’s nest and stealing their chick or egg! Glaucous Gulls are very similar to Common Gulls, Herring Gulls etc., but the key identification features are: considerably larger than Herring Gulls etc. ; Pink feet; pinky-orange legs; white head, neck and underside; grey wings and a yellow iris with a black pupil. I believe that an Ivory Gull is high on a birder’s wish list, a fact that I only found out when I got home from a trip where I saw four! The ornithologist on board the ship said that he wouldn’t guarantee one on a cruise, though we saw our first two at the same place on day 1! They were fleeting glimpses of flyovers but it is hard to mistake these beautiful birds with anything else on the island, the adults have pure white bodies; ink black eyes; a grey bill tipped with yellow and orange and black feet. The juveniles are similar, just with black dashes or arrowheads on the wings. 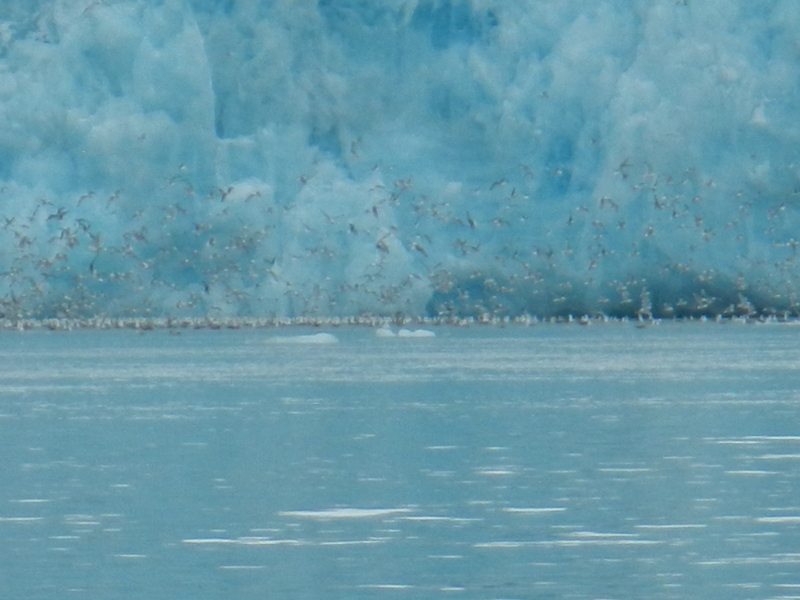 The third Ivory Gull was seen on a zodiac cruise of another glaciated bay, it literally sat on an iceberg right next to the zodiac as if it was sitting on eggs. 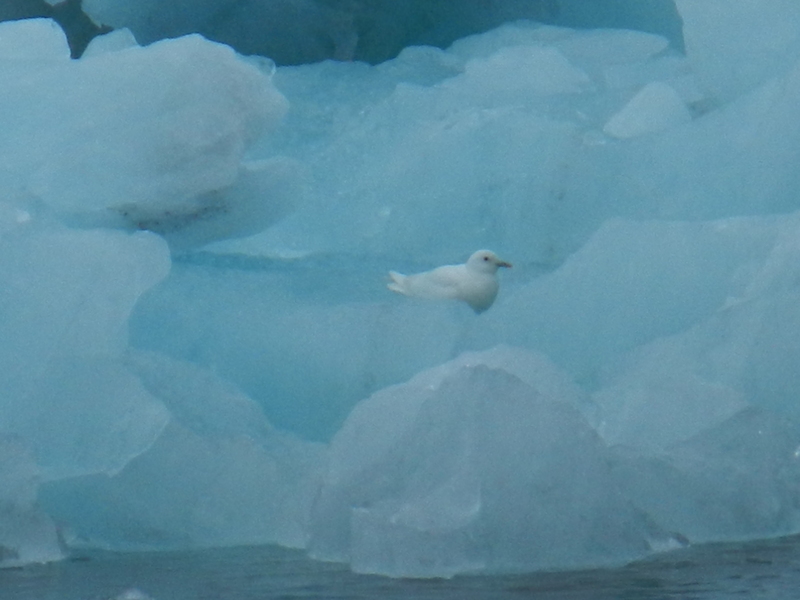 That was my favourite Ivory Gull sighting because it was the only time I saw one not in the air and I got a photo! As the first Ivory Gull was seen on day 1, our last Ivory Gull circled the ship as we pulled in into Longyearbyen on our final morning! These are very small gulls and we only saw 2 of them, at the same place. The place we saw them was an island called Moffen Island, where there were many Walrus hauled out on the beach. Tony, the ornithologist, said he only sees them 1/3 of the times he comes here and he doesn’t even come here all the time! Fortunately I was the first person to spot one, it landed in front of the main group of Walrus then flew off behind them. There are only 1 or 2 pairs on the island, so luckily we saw one pair a little later. They look rather like Black-Headed Gulls, though with a much greyer head and a yellow tip to the bill. They also have a large black patch on the wing which is visible in flight, ranging from the ‘elbow’ to the wing tips. Moffen island is a reserve and walrus sanctuary, which meant that we were not allowed to come more than 300 metres from the island, so we had to observe them from the ship. For our summer holiday we decided to go on a circumnavigation of Svalbard, mostly for Polar Bears. Fortunately for us we were in luck, we saw 13! Our first Bear came on day one, certainly a nice start to the voyage! The Polar Bear was on an island, feeding on Arctic Tern and Arctic Skua eggs. It was constantly being mobbed by the defensive parents and it was very nervous. That meant that when we went out on zodiacs to get a closer look, it moved to the other side of the (small) island. We saw a few family parties of Common Eiders next to the island too as they choose to nest with the Arctic Terns for their protective nature. Day two brought our second Polar Bear, spotted by someone in our zodiac on a cruise around a glaciated bay. We saw it before we had even entered the bay, which meant that we didn’t have much time for the rest of the excursion! It was a very dirty specimen, easy to see when it walked in front of a patch of snow or ice, though it wasn’t in bad condition. On day three we came across no less than three bears on a single slope, showing absolutely no interest in each other! They were also a mile inland which is unusual in its own right! Day five heralded the best Bear sighting of the whole trip, at somewhere where we would never have dreamed of seeing a Polar Bear! 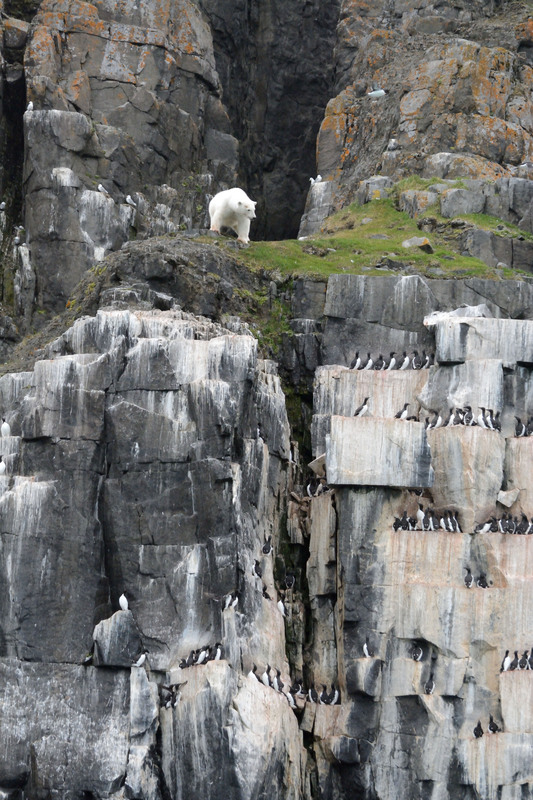 We were cruising a bird cliff, full of nesting Brunnich’s Guillemots (Thick-Billed Murres), Black Guillemots and Kittiwakes, when someone spotted a Polar Bear halfway up! Glaucous Gulls were continuously mobbing the Bear, even drawing blood! The Polar Bear got his revenge however, and swiped at one of the gulls and killed it! All of the staff said they had never seen this kind of behaviour in their life and that I probably would never see it again! Day six had the same number of Polar Bears as day three, but a little bit different. We were zodiac cruising Duck Island, a nature reserve known for its breeding wildfowl, when we found a collared female Polar Bear with a cub! It was obvious that it was a female guarding the cub and not a male eating the cub (they often do) because it is not possible to put a collar on a male as a male’s neck is thicker than its head! However, we did find a male Polar Bear on the island opposite the one the mother and cub were on, just patrolling the stretch of coast. I would say that would be target achieved!